Justin and I have our first shower at the end of the month, so naturally Pinterest has become my place to hoard ideas to casually pass on to my sister when she starts the planning for our much later shower. Just to give you a taste of the fun things collecting on this Pinboard, here are some of my favorite pins! Switch it up from traditional “Guess whose baby picture” games with this cute idea. 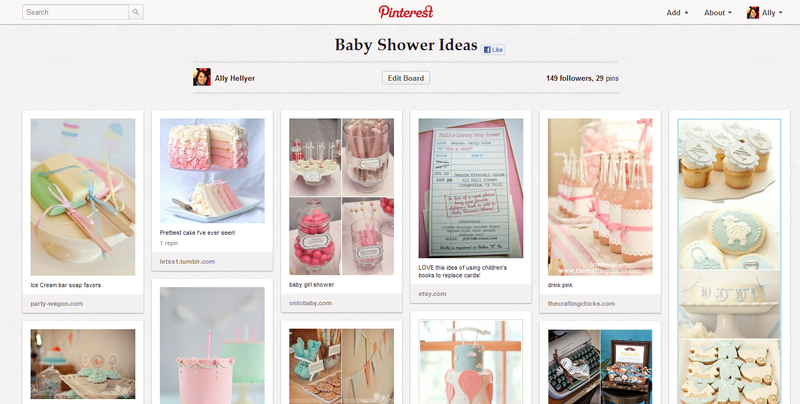 This baby shower game was pinned from Oh Baby! Blog Have each guest bring a onesie that represents their personality and have the Momma or Papa-to-be guess whose is whose! Finally, think of something unique to give to your guests as a thank you for showering you and your baby in all kinds of love. I love these “sweet treat” soap bars from The Party Wagon in pretty pastel colors! You can follow all the fun of this Pinboard and all my other Pretty on Pinterest Pinboards by following me here! Happy Pinning! Thanks for looking!